When Lady Elizabeth Bowes-Lyon married Albert, Duke of York at Westminster Abbey she wasn't expected to be queen. She was also marrying into a royal family that hadn't really done bridal tiaras for a while. So the lack of diamond diadem was less surprising than it might have been. Instead, the woman who would end up as Queen Mother chose to wear myrtle in her hair with a white York rose on either side of her headdress. Yep, even then, Elizabeth knew just how to do things right. This dress is very 1920s and really rather simple for a woman who would become one of the last empresses of the 20th century. Not many of those just wear flowers in their hair. Just three years later, one of the most popular royal brides of the twenties swerved a wedding tiara chance not once but twice. Astrid of Sweden's marriage to Leopold, heir to the throne of Belgium, was one of the love stories of the time. 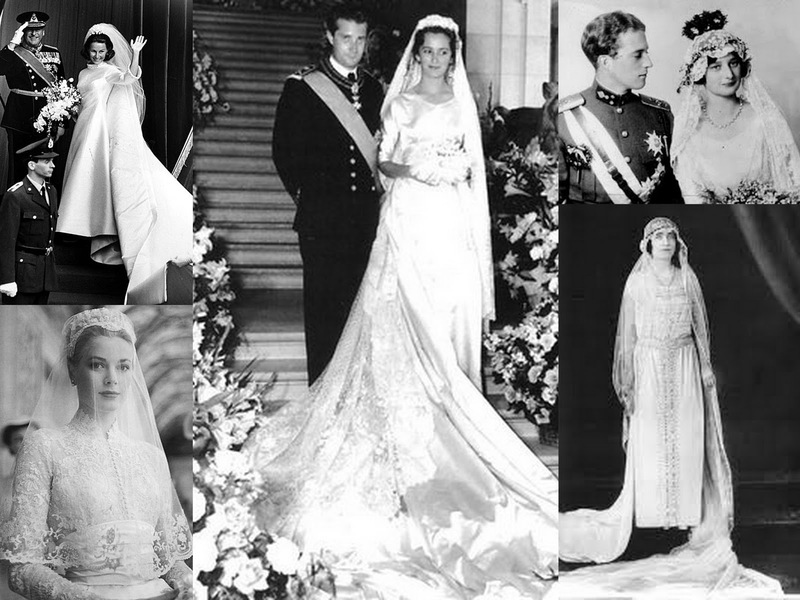 The couple were hugely popular with massive crowds gathering for both their civil wedding in Stockholm on November 4th 1926 and again for their religious ceremony at the Cathedral of St Michel and St Gudula in Brussels on November 10th that year. Astrid didn't wear a tiara to either celebration. She kept things very traditional for her home wedding, choosing a Swedish crown of myrtle to top her lace veil. There was even less adornment for her Belgian wedding even though just about every female guest at the ceremony was wearing a tiara. Astrid was marrying an heir to the throne but chose to do things her way. She would become Queen of the Belgians in 1934 on her husband's accession as Leopold III. Queen Astrid died following a car accident on August 29th 1935. 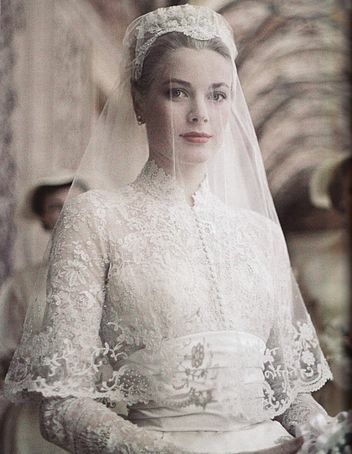 Grace Kelly wasn't just marrying a sovereign when she walked down the aisle in Monaco to say 'I do' to Prince Rainier III on April 19th 1956. She was creating the image of the perfect princess. The Hollywood superstar turned royal bride was dressed to impress by Helen Rose of MGM and the two of them decided to ditch the diadem. Instead of a tiara, the bride the world wanted to see wore a beaded lace Juliet cap. But then Grace didn't need diamonds to sparkle. Her wedding look was iconic from the moment it appears and remains the same today. Like Elizabeth Bowes-Lyon, Paola didn't think she was marrying a future king when she said 'I do' to Albert of Belgium in Brussels in July 1959. Her new husband was the younger brother of King Baudouin of the Belgians who, at that time, was expected to wed and have children himself. So Paola's marriage - which she had wanted to have in Rome - was a lower key affair although still packed with royalty, a huge train and epic amounts of flowers. And the bride's decision to wear orange blossom in her hair rather than a tiara was a bit of a departure from the expected norm at the time although all eyes were on her Brussels lace veil, a family heirloom of hers. Paola ended up Queen of the Belgians when Albert succeeded his brother in 1993 after Baudouin and his wife, Fabiola, had no children of their own. Albert abdicated in favour of his son, Philipppe, in 2013. Like many a 1960s bride before and after her, Sonja Haraldsen went fake flowers for her hair ornament. Never mind that she was marrying the future King of Norway. Never mind that their royal romance had caused all kinds of controversy as the Crown Prince was meant to marry regally. Never mind that on saying 'I do' Sonja became the leading lady of Norway as her new father-in-law, King Olav, was a widower. None of that was enough to persuade Sonja to drop her dream look and swap a (rather pretty) artificial flower arrangement for a tiara. She chose a small spray of white flowers to top her simple veil and dress. Sonja, who became Queen of Norway in 1991, has never knowingly shied away from a tiara since her wedding but on the day she became a royal bride she chose to do things her way and keep the flowers unreal.